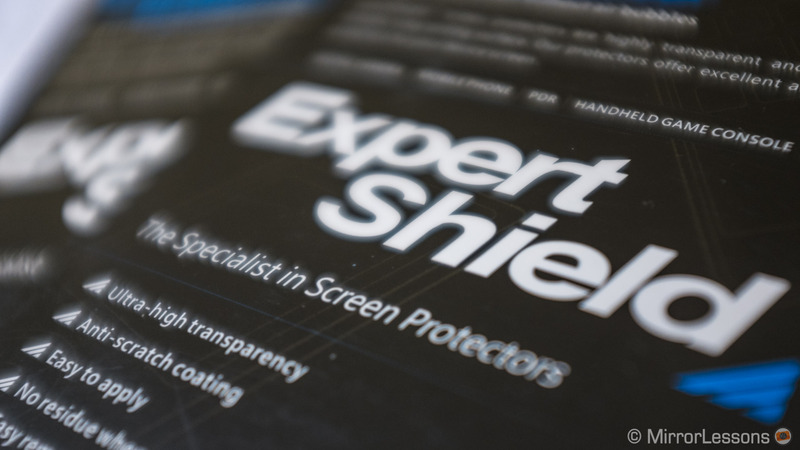 Ethics statement: I have been asked by Expert Shield UK to test their screen protectors but I haven’t been paid to do so. The following reflects my thoughts and my thoughts only about its products. 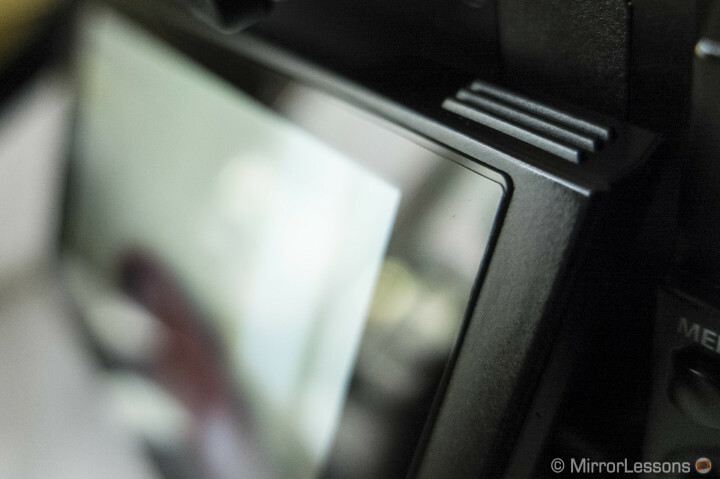 Screen protectors tend to be a given for our smartphones, but it is less common to use them on digital camera LCD displays. We have the tendency to think that smartphones are more likely to be scratched because we place them everywhere – in our pockets, or in our bags, both of which are filled with potentially hazardous objects such as keys or pens. But camera screens can be just as vulnerable, which is why protecting them is a good idea. 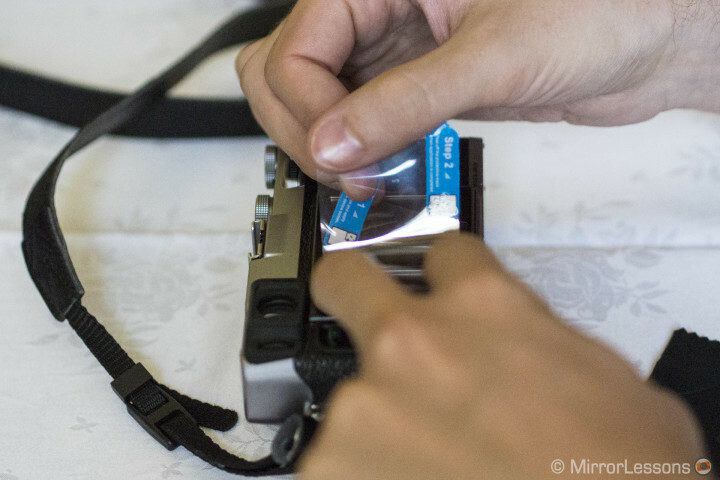 With my Nikon DSLRs, a transparent solid screen protector was supplied with the kit, so I never had to worry about protecting my LCD display. 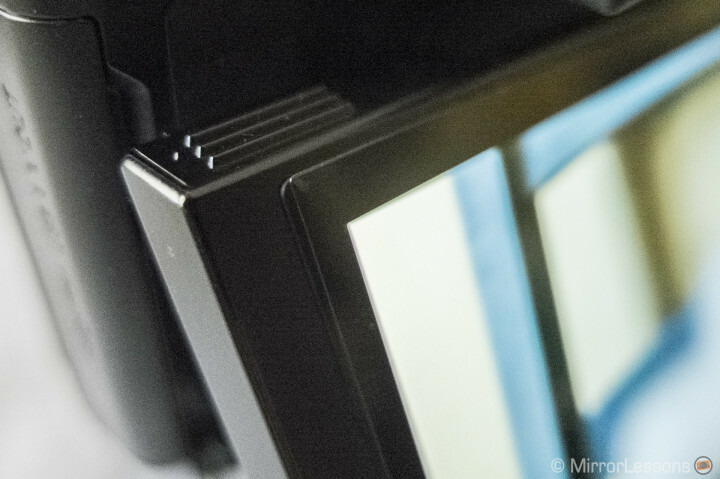 However, now that I often use mirrorless cameras (which don’t have a screen protector included in the package), the importance of protecting their LCD screens has crossed my mind more than once. Now, the first question one might ask before investing in a screen protector is: is it really necessary? In my humble opinion, yes, but often, putting on a screen protector may take more time than we’d like, and we always end up with some undesirable air bubbles or with the screen misaligned along the LCD edges. 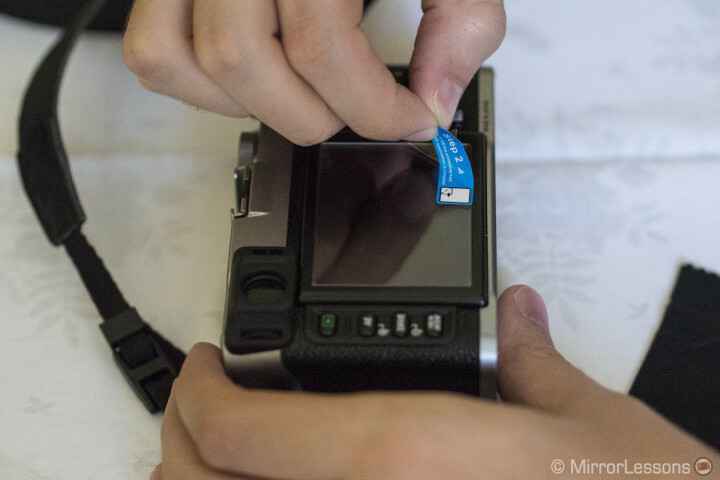 It is a simple operation but requires some patience and a little bit of attention, so if you have had a bad experience with your smartphone, you could be discouraged to do the same with your camera. With Expert Shield, the first thing I noticed is that they don’t produce bubbles and are very easy to apply. 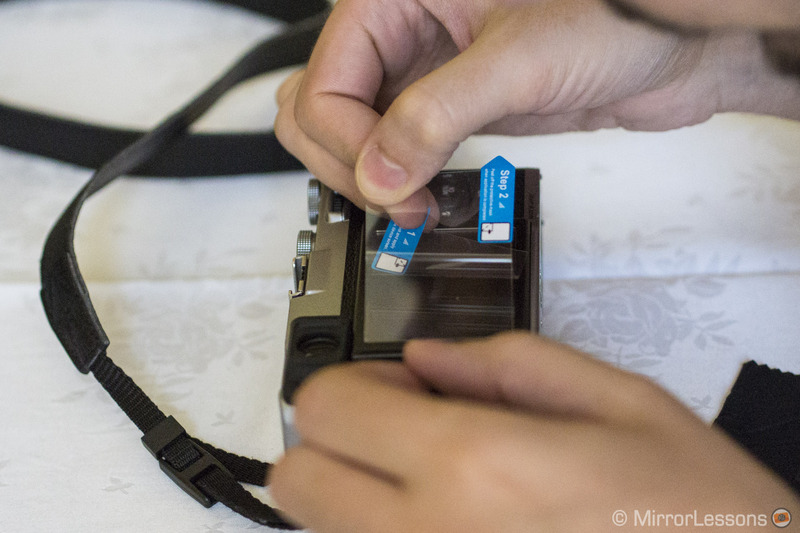 Scientifically, I can’t explain why, but while I always had trouble with the screen protectors I used in the past with my iPhone, the Expert Shield protectors I applied to my X100s and OM-D E-M5 were bubble-free the first time around! So, either I was lucky, or those protectors apply better than most as the company states. I think the second supposition is probably correct! Let’s open the first one! The package includes only one screen protector but it is accompanied by a nice lint-free cleaning cloth. A nice lint free cleaning cloth is found inside every ES package. 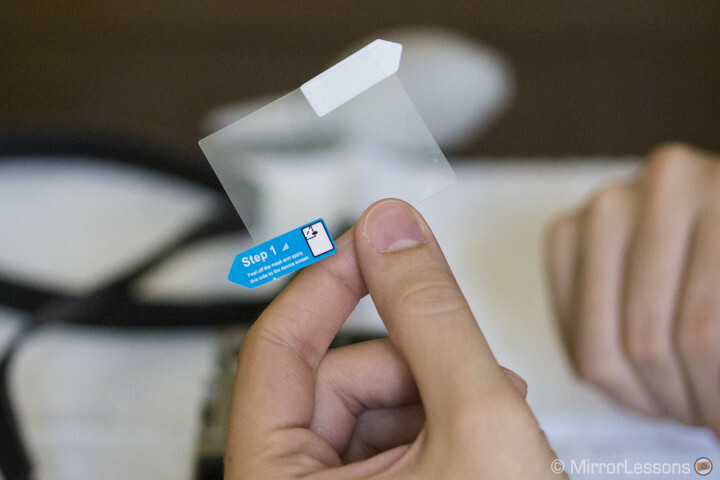 Applying the screen protector to the display is very simple. First, it is always recommend that you clean the display properly to reduce the chance of bubbles developing. 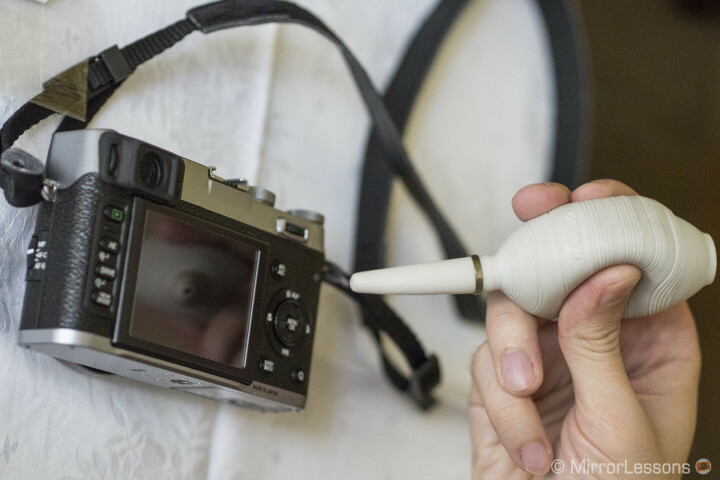 If you also own a lens cleaning kit like I do, it can be a good idea to use a little air pump in addition to the cleaning cloth to remove the dust. Take a little time to clean your display properly. If you have a little air pump, use it – it will help you. Once this first step is finished, you can go to phase 2. 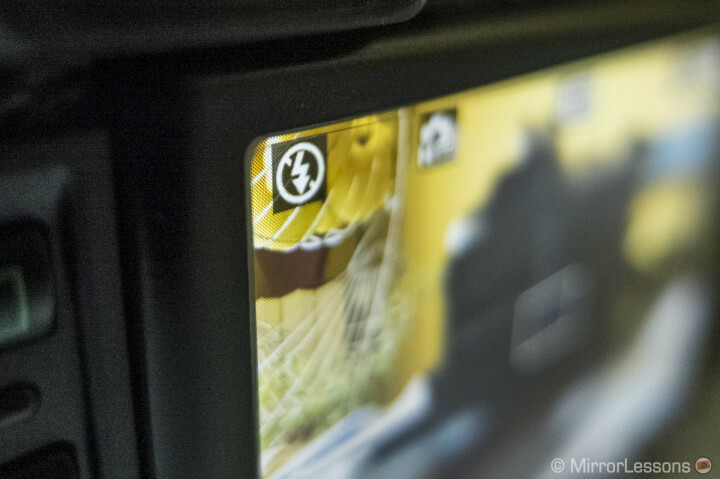 Lift up the “Step 1” sticker, then align it with the left or right edge of your camera display. Begin with the “Step 1” sticker. Once you are ready, slowly remove the sticker and at the same time press down on the screen protector with your fingers to flatten it. 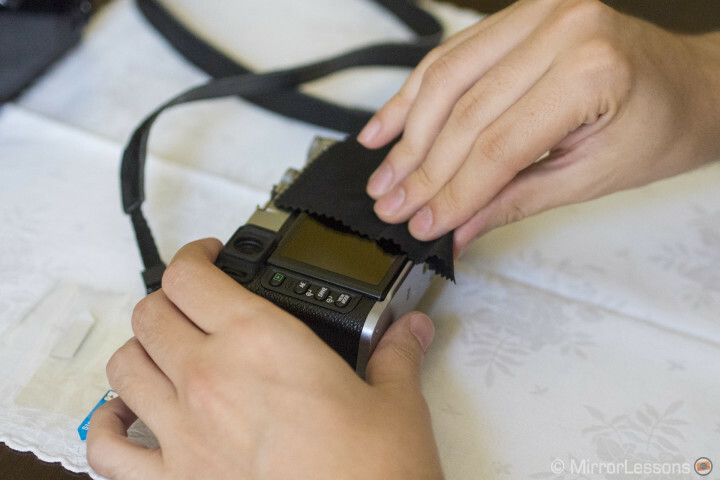 You can also use a credit card or business card to be more precise in laying down the screen, but I found that it is just as easy to do with the fingers, as they apply quickly and precisely without you having to press down too hard. Once you have finished, make sure that every corner is properly laid down (use the cleaning cloth to make sure it is entirely flattened). 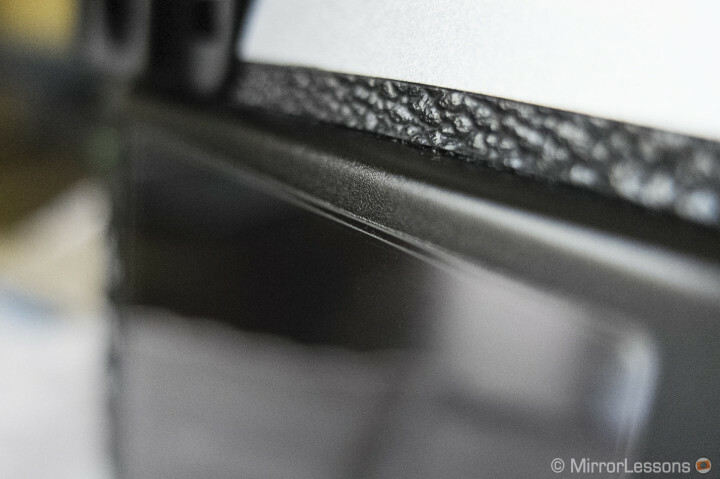 If you see some unwanted bubbles, bring them to the edges quickly to eliminate them. Once you’re done, you can slowly pull off the second sticker (Step 2) and voila, the application is finished! Once the screen protector is applied, you can pull off the second layer. Flatten it one last time to make sure all the edges stick to the display. The final result: very clean, elegant and… discreet! 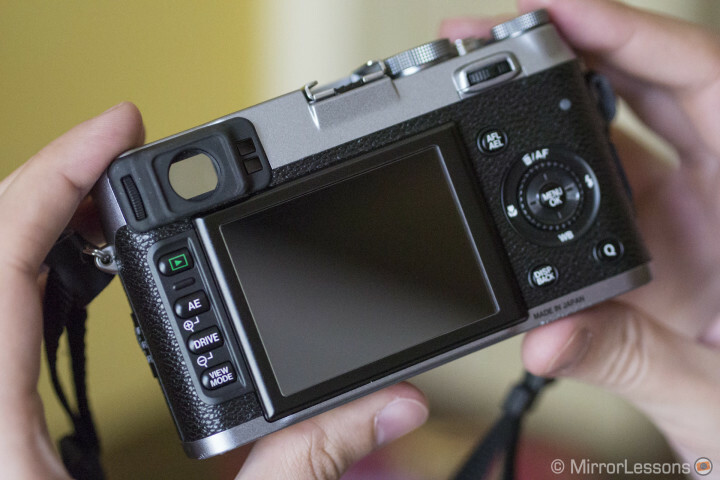 As you can see, the size of the screen protector perfectly matches the display of my X100s. 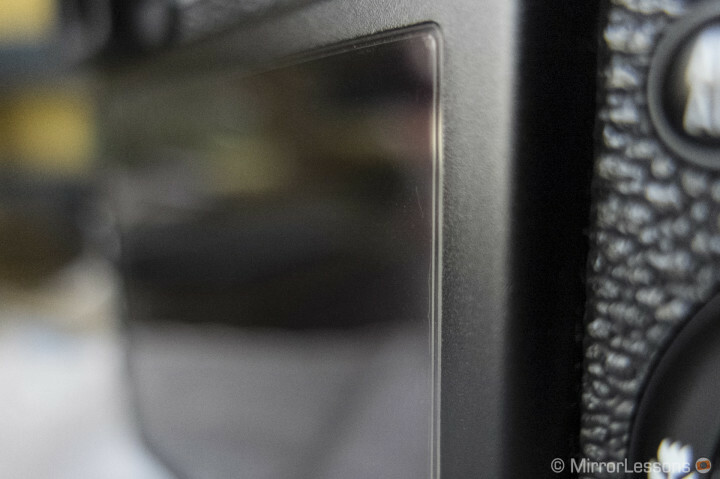 Looking very closely at the edges, you will notice that the Expert Shield screen protectors fit very well along the edges of the display, and remain perfectly clean and attached. This is another positive aspect because usually bad screen protectors won’t stick well around the edges. …you can see how clean it remains. 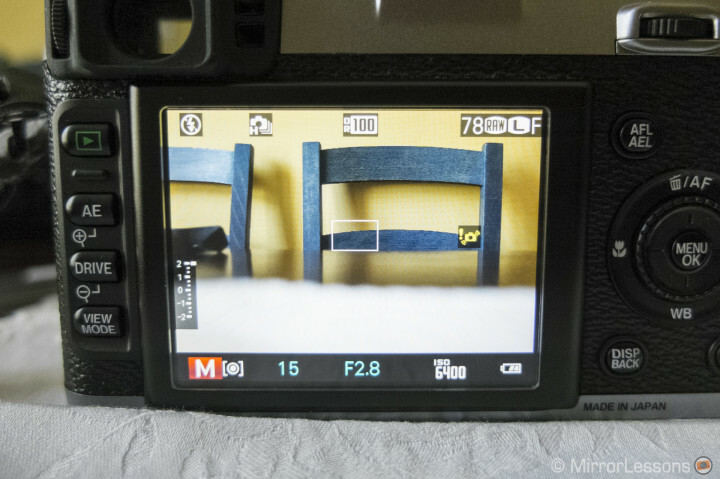 Turning on the camera, I see that the screen doesn’t affect sharpness, contrast or colour of the LCD at all. 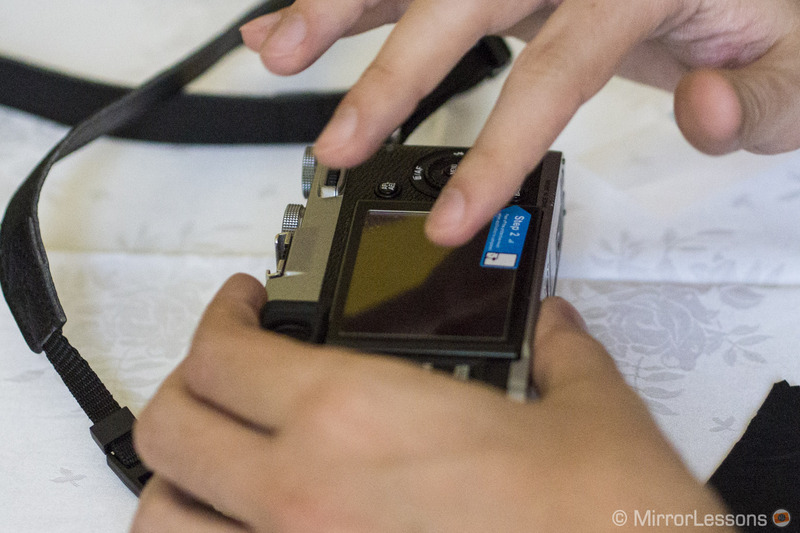 The LCD is on… who could have guessed there was a SP on it? If you look very close… you will notice it. 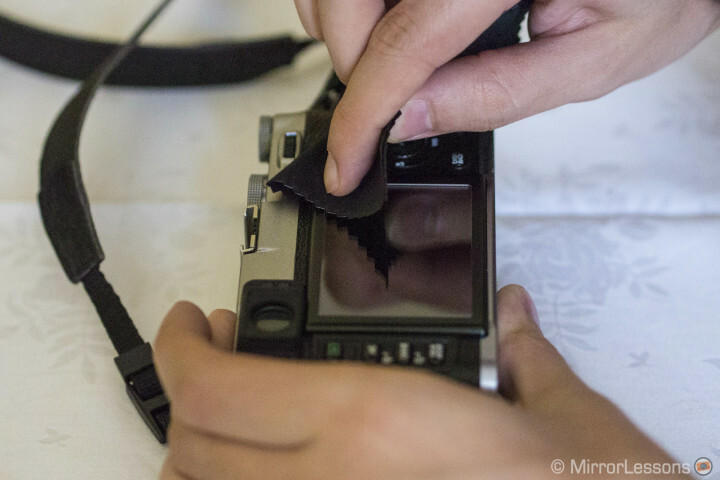 Below you watch a quick video showing how I applied the screen protector on my Olympus OM-D E-M5, and see some close-up pictures of the edges. You will see that the Expert Shield works wonderfully with touch screens. Since I have just started using these screen protectors, I cannot talk about durability, but I can say that my first impressions are very good: not only do they seem resistant, but the precision with which they are made and way they perfectly fit the size of the LCD can only make me think positive thoughts. Of course, only time will tell, so I will update this article in a few months. As for scratch resistance, I won’t do any hard testing such as scratching with keys or scissors as it wouldn’t be a “real-world” test. I will let the following months of intense usage determine their true resistance and durability. 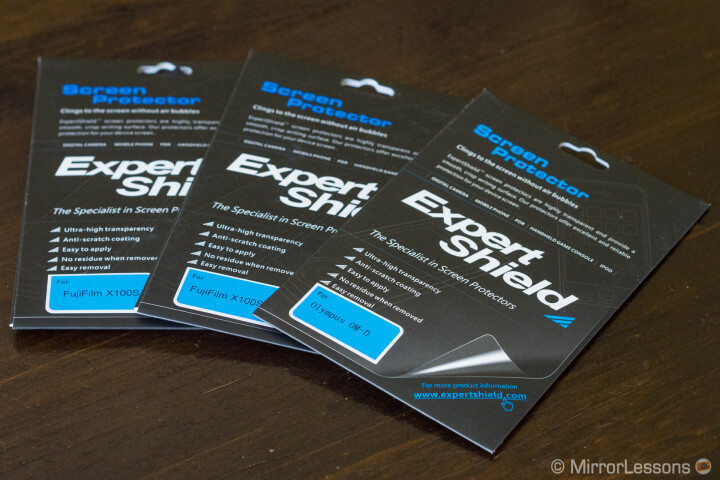 The Expert Shield screen protectors have left me with a very positive impression so far, first because they are easier to apply than any other SP I’ve used before, and secondly, because the risk of bubbles appearing is small, which is, for me, one of the best aspects about this product. 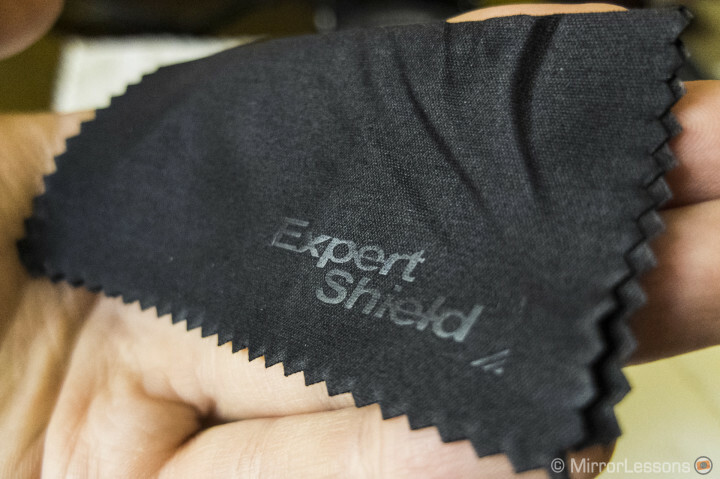 The precise size of the protectors lead me to believe that Expert Shield is serious about producing quality products. Plus, it comes in a nice package, complete with a cleaning cloth, and has a lifetime warranty. They are also completely washable and reusable. In summary, I am sure the Expert Shield SP will do a great job of protecting my LCD from sand, little stones or small accidental falls. And this is exactly what I expect it to do. I can only recommend it considering that the price is more than affordable, and it will give extra protection to your expensive camera and one of its most precious components.